When the weather’s as chilly and miserable as it has been in Melbourne this week, the only sensible thing to do is play around with your wardrobe. 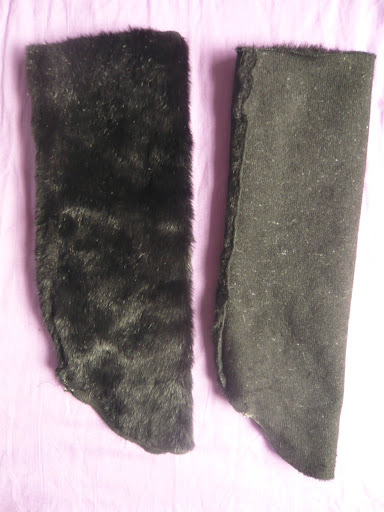 So while faux fur legwarmers might sound ridiculous, they’re really quite a logical choice. 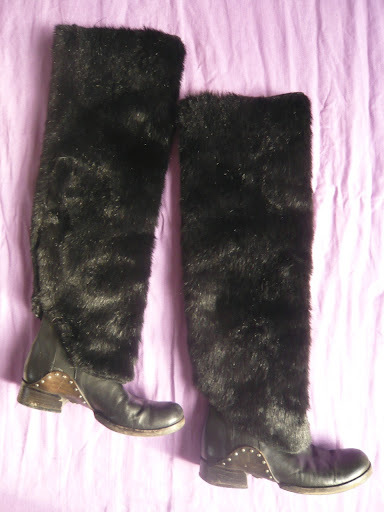 Oh, I didn’t mean worn Flashdance-style, I was talking about wearing them as boot covers, of course. See? Two years earlier, though, I didn’t have these boots. They’re from a Salvos store and were only about $10, although I paid $40 at a shoe repair place for the back seams to be repaired. It turns out, though, that they are very close fitting around the calves, which makes my stick-figure legs look even more stick-figurey. 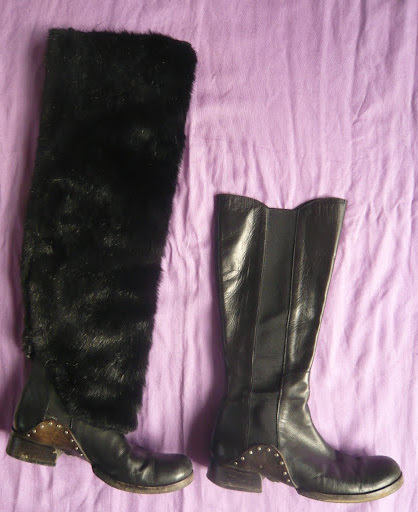 See what the boots look like without the legwarmers? 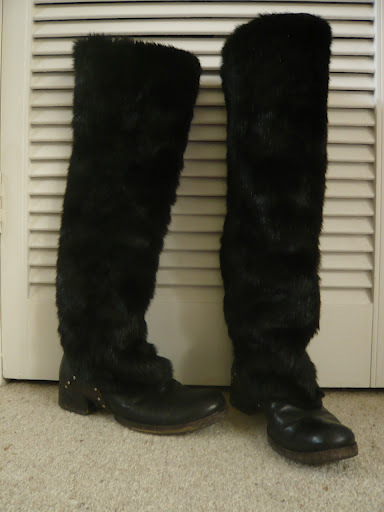 They’re also a little bit shorter than I’d like, so not only do these furry legwarmers make my legs toasty, they also add texture and, more importantly, flattering length and volume. 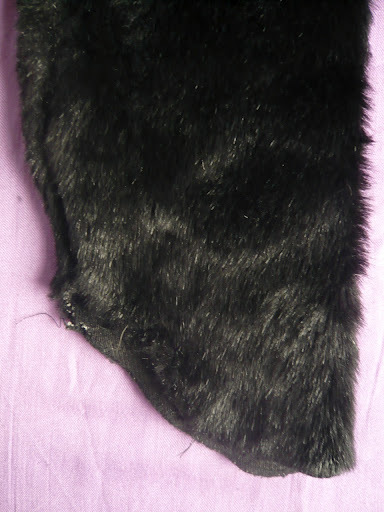 They’re super easy to make, so if you have some fake fur (or leather, or even canvas) lying around, why not give them a go? Here’s what they look like when laid flat (the one on the right is turned inside out). Although they are basically loose tubes, there is a bit of shaping around the heel and towards the front of the foot so that they sit properly over the top of your footwear – whether that be boots or shoes. Not too tricky, really (this is the inside-out version)! 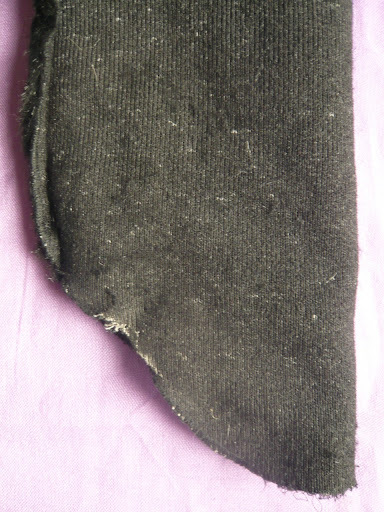 A short warning about using fake fur, though – it gets EVERYWHERE, as I mentioned in the previous post about these. If you’ve got a cat, you’ll have some idea of what I mean (I found a cat fur in my EYE the other day when I was at work, where – unfortunately – there are no cats). Fake fur is a zillion times worse, so be prepared to be fishing it out of your muesli for weeks after making these! ← If you want to destroy my sweater….